I celebrated the first day of the year with...a day OFF! I spent it in my PJs, in part sorting through a year's accumulation of paperwork, including my workout and racing-related papers. I added all the printed weekly training plans to a binder, and enjoyed flipping back through to see all the fun I'd had! I love racing, but I LOVE LOVE training. 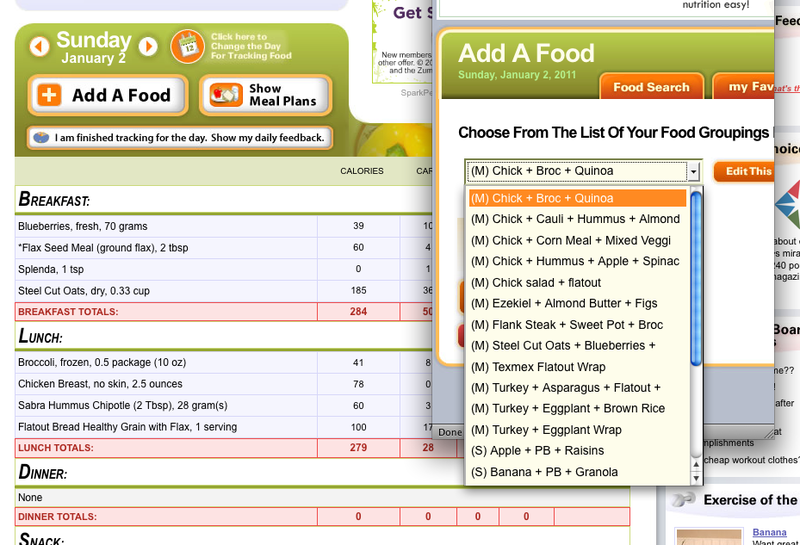 For some reason the trip down workout memory lane inspired me to enter all my basic meals and snacks on Spark People which is a free online community that supports fitness and weight-loss goals. 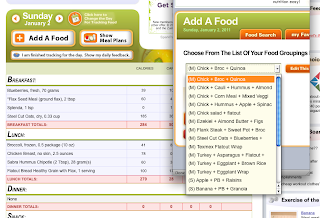 They have a nutrition and meal-logging site that works well for me and allows users to create food groups that can be plugged into a custom daily meal plan. I enjoy the process of making a day's menus of snacks and meals, preparing it, and not having to waste time thinking about what to eat. For me food is definitely (1) fuel and (2) a means to not be hungry. I enjoy good simple whole foods. January 2, it was back to work. I did an interval workout on the rower, bum leg propped up on a DynaDisk. Jake devised a series of intervals with a diminishing rest period, and the heart rate chart below shows that you can indeed get a good cardio workout on the rower!! I hit 168-170 on each interval. I think I even made those grunting gym noises that any self-respecting female would not do. Later I hit the pool for my first workout of the 6-week intensive swim block that Coach Jim and I had planned. We are still going ahead with it. 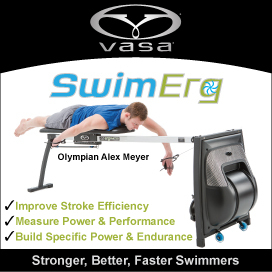 I used the pull buoy for most of the drill work, the zoomer for the main set, and did just a few odd laps without any equipment. I am settling into a groove with my one-legged swimming. In two days registration opens for the Virginia Triathlon Series events. 2011 is here!! I have a race plan and game plan, but I need to spend a little time developing some specific goals.